We started gathering data for this guide on the best luxury air mattress and adjustable bed foundations back in 2016 and it took us about 8 months to get it published in the first place, simply because the data sample we had wasn’t big enough to rate the beds and the bases. Since then, the guide has seen about a dozen of updates. The main reason we initially set out to compile this guide because we’ve been receiving a lot of requests from visitors to offer alternatives and research the companies that are Sleep Number competitors and adjustable beds that are like Sleep Number models but not as expensive. This months update is complemented by the fact that Personal Comfort has won their second back-to-back lawsuit against Sleep Number. Sleep Number sued them for their advertising that includes claims about their beds being "better & preferred over Sleep Number" and "upgraded versions". The important part is proving the claims to be accurate. That's what happened - Craig Miller (President of American National Manufacturing, a company that makes the beds) assembled a bed in front of the jury, pointing out where the "upgrades" were and the jury deemed that the advertising claims are accurate and rules in favor of Personal Comfort Beds. Personal Comfort airbeds and 2 out of 3 currently best-rated luxury air mattresses come from Personal Comfort. We have absolutely nothing against Sleep Number. In fact, we love their beds, it’s just that the competition in this category is much better rated in the “Value for money” category that we don’t have any Sleep Number Models in the 3 top rated luxury air mattresses. Bottom line - for a portion of the investment one can get a bed that’s at least as good. Let us get to the results and ratings - these are the TOP 3 choices among luxury (adjustable) air mattresses. The Comfort A8 is currently the top rated luxury air mattress. It was pretty clear after a few months of gathering data and reviews from existing users that this will be the bed to beat. The company making it (Personal Comfort) advertises the bed as a competitor to the Sleep number C2 for a part of the cost. Patented reversible cover has a "winter" that reflects your body heat and keeps you warm, while the "summer" side uses smart breathable fabric to keep you cooler. Dimensions: 80 x 76 x 13 "
Indeed, all the beds in this range are expensive but we found (based on the experiences with existing users) that this models offers the best value for money, especially compared to similar products from other companies. The Elegance A8 is one of two mattresses in the history of our website that received the rating of 95/100 (EVER). Let us first address the difference between the two ratings categories as we’ve seen some confusion over these in comments. Generally, mattresses with based on air chambers are both more durable and have longer life-span than any other type of mattress. While the two terms can be confused (as they often are), in this context they represent two completely different aspects of a mattress quality. The best way to explain would be an example – a bed that can take more in, let’s say, weight without significant damage, would be more durable. On the other hand – a bed that retains it’s characteristics over a longer period of time will have a higher score in longevity. Having said that, this luxury air mattress has very high ratings in both categories - 96/100. The 25-year warranty supports the high-ratings as it should with a bed at this price point, it's more of an investment than a purchase. The adjustable levels of firmness of the Elegance A8 allow for both superior comfort and support levels – rated at 97 and 96 respectively. The sturdy edges that are (in our opinion) better compared to those in Sleep Number models add to the comfort level. While there are models of luxury air mattresses that are not the best choice for side-sleepers with back problems (those with thinner top comfort layers) , the A8 Elegance includes a thick comfort layer that contours to the body very well and relieves any pressure points and, consequently, back pain. We feel that this adjustable air mattress hits the sweet spot in motion isolation, although we never felt like motion isolation is a primary quality factor. It’s not, however, a bed that will allow you to jump on one end without spilling a glass of wine placed at the other, like in those Tempurpedic commercials you might have seen. In all honestly, we’ve always consider the wine spilling thing was an advertising gimmick and asked the simple question, “What does that prove?”. Better motion isolation also makes it a pain to turn around. This category is nowhere nearly as important as the rest of them. It refers to how easy it is to set it up once it arrives and how easy it is to find your firmness level. This means that it becomes irrelevant after a week or two once you find your perfect firmness level. We have seen reports of people saying it takes more time to set it up then the company claims and that’s probably true, but you only set it up once and that’s a few hours compared to decades of comfort this high-end bed will provide. Also, the pump is fairly simple to use and you’ll probably only be using it for a week or two as you “play” with the firmness levels. Once you found the one that’s just right for you, that’s it. Luxury adjustable air mattresses are not cheap. Having said that, the category we rate the mattresses in is not “price” but value for money, and in those terms, the Elegance A8 is the superior choice. It’s similar in terms of features and craftsmanship to the Sleep Number I8 but costs way less. Best value for money in this quality range. 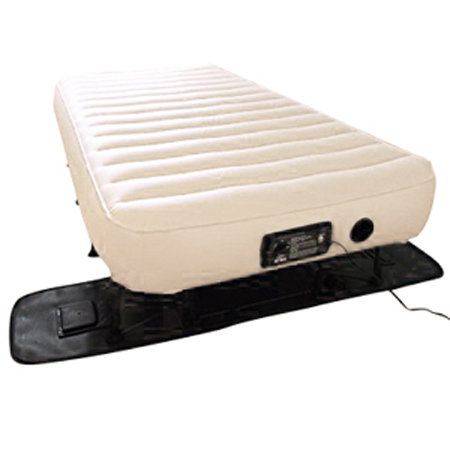 This luxury air mattress comes with a reversible top that has a summer and a winter side. The “winter” side is designed to keep you keep you warm and the summer side is there to provide a breathable sleeping surface (“smart” fabric) that will cool you off during winter summer months. The 93 "score" in this category in no way indicates that anything about the A8 is cheap, you just get better value for your buck than with other similar models. From 0 to 45, the high-end digital pump system for the inner air chambers that determine the firmness of your bed. Pressure scale is at the level of precision as that of medical air mattresses. What Personal Comfort calls 2-zone technology allows for the two halves of the bed to be inflated to different levels of firmness according to the preference of each sleeper using the touch screen control. The adjustments can now be done remotely using their app now available for both android and iOS. From the experiences we heard and read, the controls are easy to use an intuitive, even for those who are not that tech-savvy. The whole experience was worth it, starting from the fast shipping (2 days). Before getting this high-end bed we replaced beds yearly because I have back problems and as soon as a bed starts sinking I wake up in pains. So far, this adjustable air bed seems it’s worth the price…experimenting and finding the right firmness helped a lot with my back pain. Is the base included? Will it work with an adjustable base? No, the base comes separately and yes, the bed can be used with adjustable base. If this is your plan make sure you contact the company when buying the bed. As an option the company provides slits in the side rails. Can I use a regular box-spring core? Yes, most users use the same box-spring as they did with their old mattresses. It has no impact on the comfort of the bed. It’s louder compared to that of a similar Sleep Number models, but since it’s only used to change the settings every once in a while we haven’t seen any users mentioning this a problem. It’s shipped in 4 boxes, one of them 12x12x59 and three of them 18x12x39. It’s usually shipped the same day and arrives within 2-5 days. The Innomax Medallion with dual chambers, rated at 89/100, is the second best rated in the category of luxury air mattresses. Yet another worthy competitor of the Sleep Number models at about half the price for similar features, the Medallion is one of the very few adjustable air mattresses that come in various sizes: Twin XL to California King. Both the Innomax Medallion and the A8 sit at the same height of 15 inches, however the thickness of the comfort layer are different (2-7” in the Medallion, 1-5” in the Personal Comfort A8) which means that the A8 is more versatile in terms of firmness. You can’t really make the Innomax soft because of the thick Comfort top – its firmness levels range from medium to firm, while the A8 has a full range of soft to firm. That’s what brought down the ratings of the Medallion in the categories of Pressure point relief and Motion isolation to 85 and 86 respectively. This material is designed to respond and adjust to the body temperature of the sleeper which means no more night sweats. It’s not really mink but the Belgian-made cover does offer the soft feeling of luxurious mink. One of the layers of the Comfort top is Talalay latex, which is widely recognized as one of the few premium latex materials. It’s naturally antimicrobial and antibacterial. It’s also eco-friendly and made using sustainable manufacturing processes. The Contouring Temperature foam responds to temperature changes and changes firmness to minimize pressure points. However, the thickness of the comfort cover alone does not allow for the bed to be as soft as the A8, which led to the lower ratings compared to A8 in the categories of Pressure Point Relief. As opposed to our winner, the Elegance A8 by Personal Comfort beds, the Innomax Medallion doesn’t come with all the features that its main competitors do, hence the lower price. Thickness: 9 to 15 " 10 "
Thickness of the Comfort Layer: 2 to 7 " 1.5 "
base layer: 6 " 7 "
We have seen reports about the Innomax having a significant off-gassing footprint, which means that it releases smell while new.If the smell does bother you, setting it up and leaving the room to air out for a few days will solve the issue of the smell. We have seen reports of malfunctions, most often with the remote controls, but these are covered by a warranty and can be easily replaced by contacting Innomax. Innomax Medallion comes with a 10 year limited warranty on the top and the support of the edges and 2o-year limited warranty on the air system (air chambers and pump). The warranty on Innomax airbeds, however, has a relatively short pro-rated period, which means that (depending of when you got the mattress) you will likely cover at least a fraction of the cost. In its advertising, Personal Comfort doesn’t hide the fact that their beds are made to be competition for the Sleep Number models. In fact, in the case of this adjustable airbed, they openly promote mano-a-mano comparison to the Sleep Number C2. How does it compare to the C2 by Sleep Number? It’s very similar in terms of comfort and pretty much all the quality categories that count. On the positive side, it is much less expensive compared to the products with similar features from Sleep number. All we can think of on the negative side is the fact that the controls are not remote and the pump is a bit louder when it works. When compiling this guide, the Sleep Number C2 got very similar rating in most categories with this bed receiving an 88 in the category of value for money VS. the Sleep Number C2, which got a 74 in the same category. So, the overall rating of this Personal Comfort Adjustable bed is 88, while the same rating for Sleep Number is 86. This concludes our analysis about the top picks among luxury adjustable airbeds - if you stumbled upon this page looking for the classic models you can see them in this guide - best air mattress. Let’s move on to the next category of the guide. Since most of the beds we talked about don’t come with an adjustable frame, if you want to fully enjoy the experience of an adjustable bed, you’ll probably have to look into adjustable bed foundations and bed foam bed bridges (twin to king). A combo of an adjustable air mattress and a bed foundation is one of those things that you’re not sure if you need, but once you get it, you forget how you managed without it. Below are the TOP 3 best-rated adjustable bed foundations. Nothing out there can compare to the features of this adjustable bed stand so the price is a non-issues if you ask me…it’s cheaper then bases that cost more, way more. I’ve got myself a nice setup with two twin adjustable beds and two of these bases that turn the two twin beds into a king. It’s been 7 months since I got and I had zero problems with the base. At my age, there's nothing more important than good sleep. This base somehow got lost in the mail and Amazon staff was not of much help; they just kept telling me that it “in transit”. I waited a month for this thing. We collected data from any public forums trying to find existing users that would talk to use so that we can ask more than what they shared in their reviews of the adjustable bed and we found a bunch of people more then willing their enthusiasms about this product. It all boiled down to value for money and most of them were talking about the fact that this bed is the superior option when it comes to features but less expensive then similar models. Our conclusion is that this is the best “value for money” adjustable bed base out there and the rating in that category (97/100) reflects that. From the makers of the Tempurpedic Ergo and one of the most-trusted companies in the niche of adjustable beds, Reverie, comes the 5D deluxe, the most luxurious product on this list. What made the difference and put the base made by classic brands on top this time is the difference in the category of value for money. The Reverie 5D was rated 88 in the category while the Classic brands got a 97, which comes as no surprise since this reveries is about as twice as expensive. With that said, people who will be interested in the Reverie Deluxe are those who decided to pamper themselves with a bit of luxury. How high is this adjustable bed? The legs are 8 inches with an option to order 3 inch extensions. Floor to the top of the base is 15.5 inches. Is there a white-glove delivery option? Yes, the option is available with most sellers. However, some of them charge extra for it. Is this a wall-hugging bed? Can you attach a headboard? Does the message featured turn off automatically? Apart from the price, the ratings of this Reverie and the winner in adjustable beds are not that different. The difference is that the Classic Brands is best value for money base and Reverie 5D is luxury embodied. The overall rating of this Serta bed base is 89/100. The runner up in the category is also top-notch product, only it packs fewer features, has a lower weight capacity and costs more than the winner but less than the Reverie 5D. The rating in value for money of the Essentials II is 86 (compared to the 97 of the Classic Brands base), which brings down the overall rating to 89. In comparison, the rating of 86 doesn’t sound so good, but if you think about it and convert it to star ratings, that is more than 4 out of 5 stars and this Serta adjustable is a solid product, especially if you are not interested in “bells and whistles” like USB ports and wireless remote. Getting an adjustable bed was a long time coming for me, my bad back and my acid reflux. I got an adjustable airbed and this base and the setting is just right to address most of the issues I’ve dealt with over the years. Combined with a memory foam mattress, this practically resolved my shoulder pains within 2 months...can't put a price on the health benefits I'm seeing with this bed. This is one heavy unit and it comes assembled. Since it’s already one piece, it was kind of difficult navigating our narrow hallways. I had to leave it downstairs until my brother in law came back from work, it’s a two men job. Five brands made it to our TOP 10 list of adjustable bed foundations: Ergomotion, Reverie (Ascion), Leggett and Platt, Serta and Classic Brands. None of the top ten adjustables had any significant quality issues. Rather, the decision came down to the “value for money” category and the ratings there were the only that ranges from 75 to 97. What this means for you is that a lot of this decision comes down to your personal preference (design, colors of your bedroom, modern or classic). We do update this guide on 2-month basis but for right now, we have a clear winner, the adjustable bed base from Classic Brands. We did our best in our research and we sincerely believe that the adjustable bed reviews that we presented are reliable and solid guidelines to navigate through the confusing market. But let us take it one step further and understand what’s behind the choices. This way, if you don’t like any of the adjustable beds, you can look for your own and know what to look for in one that will be worth your money. Most of what you’re paying for, you can’t see. Adjustable beds have changed a lot since the ole Craft-Matic first impressed us. It’s fine to pay more if you like the design, but make sure that what truly makes a quality adjustable bed is there, too. Whether you are getting one online or from a brick and mortar store, the company or the salesmen are aware of the fact that an average customer is pretty much clueless about what to look for. Unless it’s a truly well-made product, they don’t want you to look under the hood. So, let’s level up the playing field by arming you with all the right questions you need to ask before making a decision. What counts the most is the chassis underneath the bed, the superstructure. This structure is a simple steel frame with two rails. Each section of the adjustable bed is carried by these two rails. These rails are then attached to a plywood deck. The adjustable panels (sections of the base) allow the bed to adjust positions are carried by this steel frame. The motor that runs the whole thing and determines the positions is attached underneath the deck. Look for the features you’ll actually be using – for most people this will mean USB charging ports and apps for phones and tablets. Although it doesn’t seem like a big deal now, imagine using the trip home to adjust your bed instead of doing it after a relaxing shower. Yes, it is fun setting the bed and playing with it. For about a month…after the few weeks you’ll find that a few presets that you can set up in one push of a button is probably the features that makes the most difference when it comes to ease of use. Motors and the computer board are easily accessible. If it comes to that, servicing a bed with a well-organized bed will be infinitely easier. In the long run, along with sturdy frame and thick deck, this will probably have the most impact on the longevity of your bed. The Zero Gravity position is just a fancy term for a position of the bed that minimizes pressure points and feels like gravity has less impact. Most likely you won’t be sleeping in the Zero G position because our bodies are different there’s no one position that fits us all, so don’t get over-impressed with the Zero G button. In our opinion, you shouldn’t go under 550 pounds of maximum weight. Why was this guide so different and demanding? Because our rating criteria is very strict when it comes to how big of a sample we have to have from different people to rate a bed. With regular air mattresses, we just buy the products and send to our featured testers to test and rate. We couldn’t do that with luxury air mattresses simply because of the cost. We had to take the time to gather a sample that would be big enough to offer us a reliable way to rate the beds. We feel that we did a good job at collecting experiences and rating the adjustable air mattresses. We did our best to cover pretty much everything we could think of when it comes to adjustable beds, from recommending specific products to pointing out what to look for in a good adjustable bed. That’s as far as we can follow you on the journey of choosing the right product, but do feel free to email us or use the comments section with any questions that come to mind.